Yesterday I sprayed three 28mm ECW figures with GW Purity Seal Satin Varnish. They looked great. Now I usually avoid sprays because I have had disasters with frosted figures. I used the spray because I was in a hurry. Today I sprayed another 13 figures. They frosted! Same can of spray, same shaking, sprayed in same place (outside). Today is more humid - so that must be the issue. I managed to fix the figures. Here's how. First I brushed on some Daler-Rowney Soluble gloss varnish. Worked brilliantly with no frosting. The picture shows the result. Now I need to base them up. I had the table out for a game last night. This morning I thought that I would get a visual representation of how my Punic wars armies are coming on. So here are some pictures. Just a few pictures of my Renegade Republican Romans. The whole lot. Javelinmen in front are from Crusader. Attached some shots of my 28mm Carthaginians. Figures are mostly Renegade. The Elephant is from Aventine. Slingers and Numidians from various manufacturers. Bases will be finished when I have most of the army painted. Spanish infantry. I am building the army for Hail Caesar. Standard units will be 160mm wide. 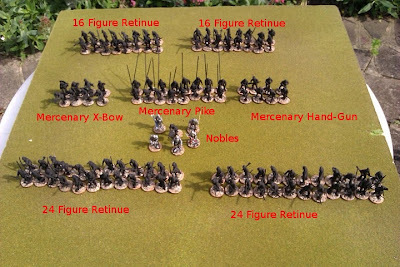 Medium infantry will be 12 figures per unit. Heavy infantry will have 16 figures. I will add some shield transfers later. The army so far. I can add a good horde of Celts and I have two more units of North African Infantry to paint. Most wargamers long for a place to call their own, the Wargames room. I now have mine. It is not strictly speaking mine, I have to share it with the kids, but its pretty close. I have a good sized space in my recently converted garage, with a table and plenty of storage. The table is made up of two 6 foot trestle tables from Amazon. They are very sturdy and a bit wider than I expected at 2 foot six each. On the table is a solo game using Black Powder and my 28mm ACW figures. These are a mix of Perry, Sash and Saber, Redoubt, Crusader and just a few Foundry. The game ended in a draw. Both sides had a brigade break in the same turn. With the stats I use for ACW with Black Powder the games are pretty attritional. Units tend to blaze away at each other trying to do enough damage to make a charge worth-while. (I lower the hand to hand value to 5). Next step. Play some real games in the new room. I have now assembled, based and undercoated all 120 figures for the first part of the project. I have organised them into units as show in the photograph.